For anyone wishing to experience the benefits of inversion. The Teeter Dex II Decompression And Extension Machine might be just the thing! The Teeter Dex II is an ideal alternative to an inversion table. It offers the opportunity for inverted decompression and extension without requiring you to hang upside down. The Dex II is also a platform that is more effective and versatile than a standard Roman Chair or Hyper Extension bench. 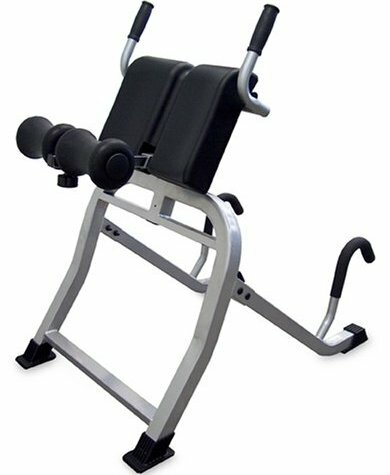 In addition, the Teeter Dex II Decompression And Extension Machine is great for a host of core exercises and stretches. What Teeter Dex II Can Do For You! The Dex II allows you to preform a variety of stretching and strengthening exercises. 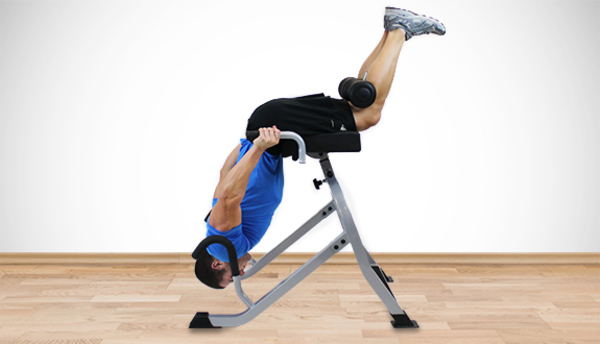 It is a forward rotating, hip support inversion device that allows you to strengthen your core and improve flexibility. With its ergonomic design you can get a more effective back workout while reducing the risk of hyper extension. You can also position your body to focus on the core instead of the thighs. The Dex II is designed with a sturdy lap support as well as adjustable leg supports. This allows you to put yourself in a 90/90 degree position. This position aids you by flattening the lumbar curve and helps to separate your vertebrata. The included traction handles, meanwhile, help you stretch your lower back in a whole new way! One advantage of the Dex II is that the majority of the traction is applied to your hip joints and spine. This means there is reduced pressure on your more vulnerable ankles and knee joints. The Teeter Dex II also allows you to target your lower back and abdominal muscles. Using back extensions and inverted crunches to build strength within your core. Lastly the Dex II is a multi purpose machine. The lower handles provide user-controlled rotation. Which also serve as useful resistance tool for stretching, dips, push-ups and band work. Teeter Dex II Quality And Features! The Teeter Dex II Decompression And Extension Machine is well made and very durable. Constructed with a tubular steel frame which has been powder coated with a scratch resistant finish. The handles have been rubber coated for added grip for your safety. Plus the added Rubber Stability Feet help prevent sliding while in use and protect your floors. The Dex II also includes a durable vinyl lap cushion. This helps to hold you while inverted and allows for comfortable performance of your inverted stretches and exercises. Teeter’s Dex II is suitable for users who stand between 4 foot 8 inches tall and 6 foot 6 inches tall. It can also safely support users that weigh up to 300 pounds. 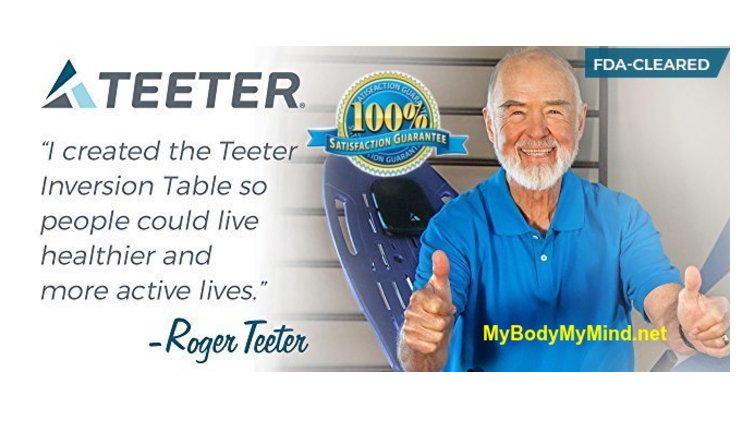 Teeter Dex II: FDA Approved & Indicated! One last feature I would like to bring to your attention is that this machine is FDA approved. The Teeter Dex II Decompression And Extension Machine is cleared as a Class 1 Medical Device. Spinal Curvature Due to Tight Muscles. Herniated Discs, Spinal Stenosis, and Facet Syndrome. As you can see, the Dex II is made to meet the high quality and standards you might expect from the Teeter brand! Teeter Dex II Product Details! Current Price: $307.59 & FREE Shipping Eligible. Financing Options: The Dex II is available for financing with the Amazon.com Store Card. Average Customer Review: 4.2 out of 5 stars 95 customer reviews at the time of this article. Amazon Best Sellers Rank: #35,061 in Sports & Outdoors. Product Dimensions: The Dex II measurements are 45 x 28 x 58 inches and weighs in at 66 pounds with a shipping weight of 67.6 pounds. Safely supports people up to 300 pounds. Well that about covers it. You should now know just about everything there is to know about the Teeter Dex II Decompression And Extension Machine! Watch This short video on how decompression helped Dr. Shawn! Dr. Shawn is going to give you a quick breakdown on how inversion can help you too! The Good And Bad Of The Teeter Dex II! In addition to that the unit is fairly easy to use and comes with easy to follow assembly and usage instructions. Plus is it back by the same 5 year warranty Teeter is known for. Another added bonus in my opinion is that the unit is some what compact and does not require as muck space for storage as the standard inversion table might require. Also while the stretch and decompression were great, I feel that the other Teeter Inversion Tables offered better results. However for someone with concerns about full inversion this is a great option. Lastly this device is a little harder to use for shorter people. I noticed that some people had a harder time getting their legs into the proper position, so take that into consideration. Here is what a few of the Teeter Dex Ii Customers have to say! Final Thoughts On The Teeter Dex II! If you are looking to get a great inversion device that has a low impact on your knees and ankles. I highly recommend you get the Teeter Dex II Today! Used as a part of a comprehensive pain management program, the Dex II can certainly help you to reduce or even eliminate your back pain all together, and you can not put a price on that! As always you should consult your physician before starting any new program, including Inversion Therapy. Or before using any new product with regards to your health and well being. Don’t suffer any longer! Don’t put it off any longer! 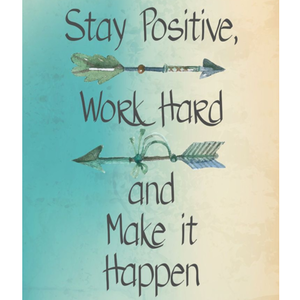 Get on the path to a Healthy and Pain Free Back Today! If you have any questions or comments about the Teeter Dex II Decompression And Extension Machine. Please feel free to leave them in the comment box located below for the fastest response. Thanks for checking out my Review of the Teeter Dex II Decompression And Extension Machine! The Teeter Dex II not for you? Click Here To Check Out The Other Amazing Teeter Inversion Tables! Previous Post Previous post: Ironman Gravity Inversion Tables – Learn More! Next Post Next post: Tight Hip Flexors And Back Pain – How They’re Connected! The Teeter Dex ll looks like a pretty good machine for my abs and lower back. This would make a fine addition to my exercise equipment that I currently use. I will also pass this along to a few people I know. They would love this for strengthening their backs. Thank you for sharing this. I found this very informational. The Teeter Dex II is definitely a great piece of equipment for any gym set up. It combines the best of the standard roman chair and other extension benches into one platform. It is great for preforming core exercises and stretching! As an added bonus it also offer a great option for spinal decompression! With such a versatile set of uses, the Dex II is great for almost everyone. While designed to help those whom suffer from various forms of back pain and injuries, it remains to be a perfect platform for anyone looking for a great workout! Brenda, even if you are not suffering from back pain I believe the Dex II offers an amazing workout platform that can be used in the comfort of your own home! The Dex II is as solid as they come and built to last! You will get years of great use out of this piece of equipment. I personally workout on a three day on, one day off routine. So I incorporate the Dex II into the second day of my routine which includes working out my abs and core. I love it, it allows a lot of workout options, so I can mix it up with each workout. This helps avoid plateaus as well as workout boredom! Check it Brenda, this would be a case of a great investment into yourself! I have the original, I can’t tell you how “AWESOME” this product is. I am totally into the Teeter Dex II. I had the original one for my back because I had spasms and a lot of tension in my back from a labor intensive job I used to have. The money I saved from therapy and Chiropractor appointments was awesome. Plus, I was getting into shape with it as well. It looks like the Teeter Dex II will enable me to do even more extensive workouts for my core and back which is awesome!!! Figure in the long-term rehabilitative care with Doctors, Therapists, and Chiropractors and $307 is nothing!!! You are very correct, $307 is nothing when it comes to the cost of Doctors, Therapists, and Chiropractors. I know that I have paid my fare share of these types of bills! What I really loved about the Dex II is the versatility. Not only is it good for spinal decompression, but it is also great for building core strength. It was not until I began to focus on building up my core before I really started to relief from the pain and discomfort in my back. It is one thing to decompress your spine, but many people overlook the importance of strengthening the muscles that support the back. When you combine decompression with strength training, you have a great one two punch when it comes to relieving back pain. The Dex II provides the best of both worlds in one great platform. And it does it for the price of just a few trips to the Chiropractor! Bruce if you already owned the Dex I in the past, then you can see the upgrades made with the Dex II. I think you are going to love it! Great review, I had used an inversion table for awhile. It greatly improved my back but was difficult on my knees and ankles. This appears to be a great alternative. I could get the benefits of inversion with my back and reduce the knee and ankle problems. Any one with an inversion table realizes that space is a major consideration as well. It takes up significant space to use. Even though mine could be folded up for storage, it was not easy to fold up so it stayed open most of the time. It took up a lot of space all the time. It sounds as if this will have the same problem. 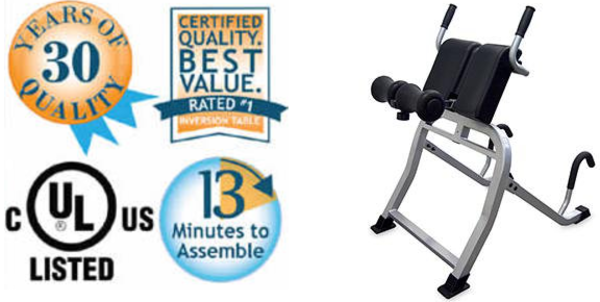 The Dex II is a great alternative to the standard inversion table. It takes away all of the stress and tension on your knees and ankles. However it will allow you to receive the amazing benefits on inversion and deep stretching! You are correct however, the Dex II does require a dedicated space as it does not fold up. However it is not as tall as a standard inversion table. This allows you to easily push it into a corner space or possibly a closet. I know space can be a problem, I have experienced it myself. But the loss of some space is a small price for the relief that inversion provides. Since you have already lived with the space issue, I would think your biggest concern would be for your knees and ankles. In which case the Dex II is the way to go! There is no point in using inversion to relieve back pain, only to cause pain and discomfort on another body part. That is where the Dex II rises above the rest. The pressure is taken from your joints and place on your thighs, which can handle a far greater load than your knees and ankles! Steve if inversion has been beneficial to you I would suggest that you keep it as a part of your life. The Dex II may just be the perfect solution for you!